Know Thy Place MD Colm Moloney describes the history of a famous attractions in his home place 0f Midleton, Co. Cork- the Jameson Distillery. In Part 1 of the post Colm outlines the history of the distillery and its main attractions. As a native of Midleton, I grew up under the shadow (and the aroma!) of the largest whisky distillery in Europe. It is a great employer for the local population and a great friend to the town. However the history of this ‘place’ and its industrial heritage provides a fascinating insight into the social history of the town and the industrial development of the country. 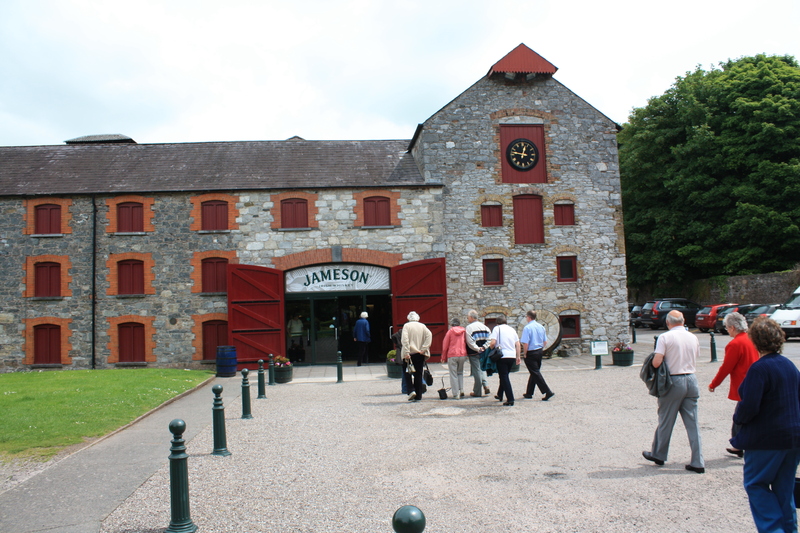 Acknowledging this fact, Irish distillers opened the Jameson Heritage Centre in 1992 in order to promote both the industrial archaeology of the site and the story of the development of Irish whisky and its growth to be a global leader in the drinks industry. The distillery in which the heritage centre is based was established by James Murphy in 1825 on the site of a woollen mill founded by Marcus Lynch in 1793. The site was also used as a military barracks during the Napoleonic wars and there is a local tradition that soldiers destined for the battle of Waterloo were trained at the site. The majority of the surviving range of buildings date from the 1830s onwards and include three malting kilns. The complex is dominated by a six-storey grain store built c. 1830, each floor of which can hold up to 250 tonnes of grain. The original wooden floors have been preserved, which makes it the most complete surviving distillery grain store in Ireland. A late 19th century brew house, complete with steel mash tuns and vats also survives intact in its original form. The late 18th century woollen mill was converted for use as a malt mill and mash house, powered by both water and steam. Its extant 6.70 m diameter waterwheel was fabricated by William Fairburn of Manchester and was installed in 1852, when it was used in conjunction with two steam engines, one of which, a six-column independent beam engine by Peele and Williams of Manchester installed in 1835, has been retained in situ. The Midleton distillery also boasts the largest pot still in the world, a wash still with a capacity of 31,648 gallons, installed in 1826, which required 4 tonnes of coal every 24 hours. Two more recent feints and low wine stills were built by D. Miller of Dublin in 1949 and are preserved in an adjacent still house. The old distillery survives almost completely intact as it was replaced by an entirely modern successor in 1975 on a neighbouring site. The completeness of the site makes it one of the most significant industrial heritage sites in the country. The promotional brochure which accompanies the tour (From Grain to Glass: The story of Jameson Irish Whiskey) claims the site is ‘the only self-contained 18th century industrial complex of its kind in Britain or Ireland’. Although the original whiskey distilled in the plant was Powers, Jameson is now produced exclusively in Midleton together with premium products such as Midleton Very Rare and Redbreast. The next installment of this two-part post will follow Colm and his wife Louise as they took a tour of the distillery. Colm was persuaded to sacrifice some of his time to conduct the visit in aid of ‘scientific research’, and bravely accepted his fate. He further impressed all who know him by showing great resilience during the excursion when he was forced to face the prospect of tasting some of the whiskey the distillery produces…. Enter your email address to subscribe to the Know Thy Place blog and receive notifications of new posts by email.